Almost Day 8 It was getting dark and the wind had picked up considerably, inside the Peterbuilt truck cab I was sheltered from that wind but not the cold, my bike thermometer read -30. Fortunately my daughter Emily had given me a good book to read (The Great Escape by Ted Barris) so that’s what I did, hunkered down in my sleeping bag wearing a toque and gloves I read until late in the evening as the wind howled outside, blowing snow and cold across the Arctic Circle and the Dempster. 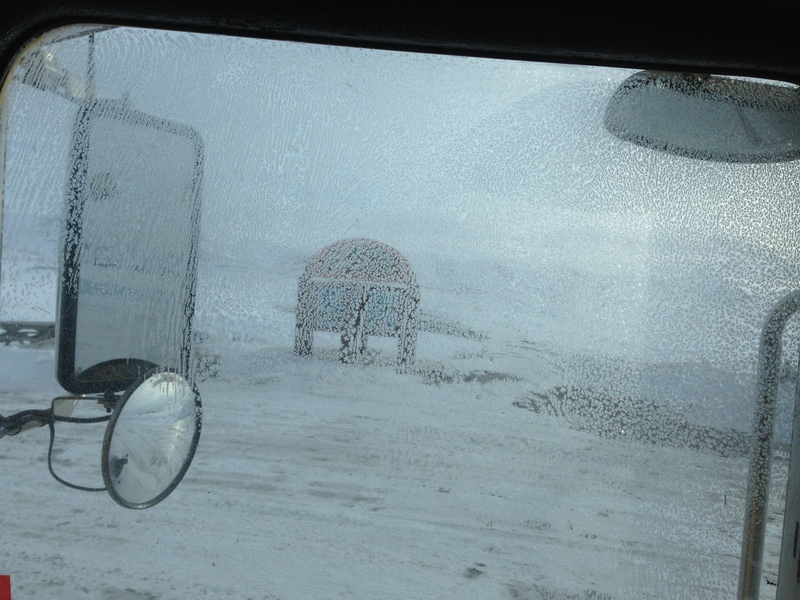 I was a happy camper; I was sheltered inside the truck cab and not camped in the snow and wind outside. April 4th . 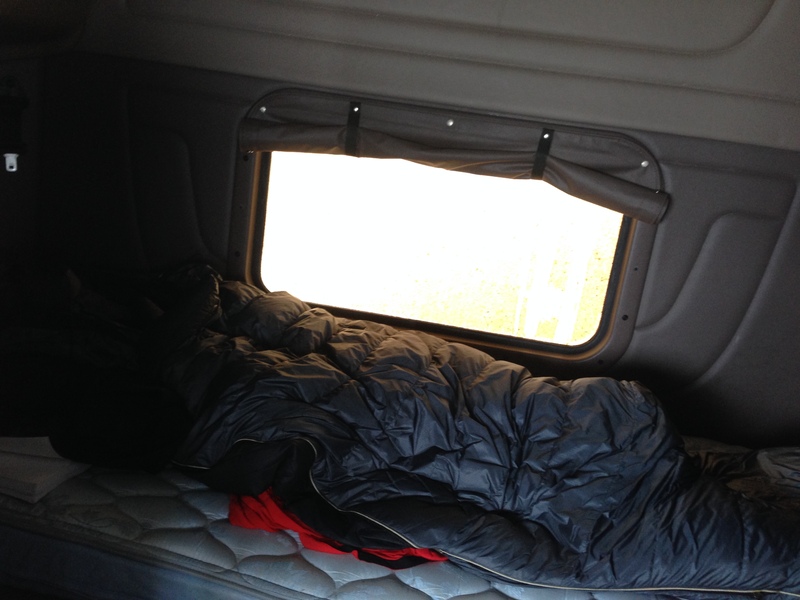 It was a long night, I slept fitfully in the sleeper cab of the Peterbuilt the bed was comfortable but the cold was intense. After a KFC chicken and granola bar breakfast, downing the last of my water (which I had kept in my sleeping bag) I packed up the bike with high hopes of moving on. It was a bit warmer; the sun was out, although shielded by the clouds. Hopefully the road would be cleared this day. 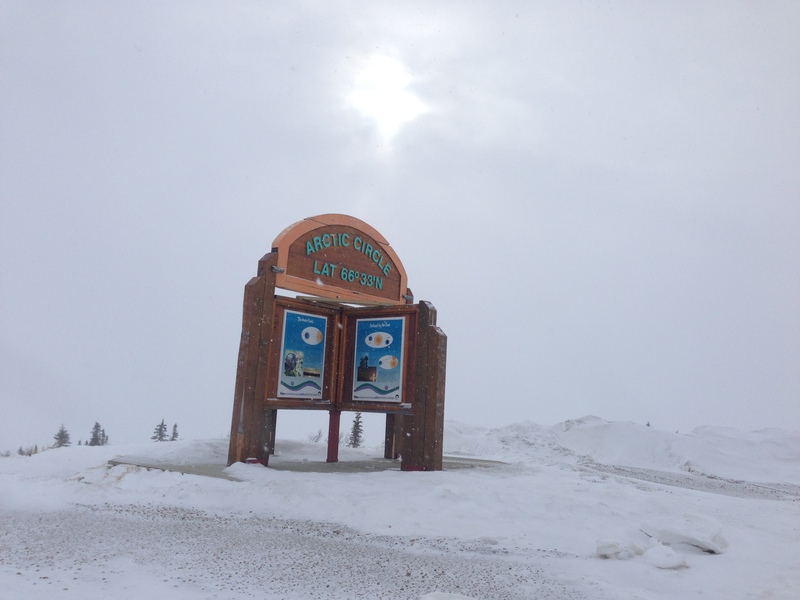 I rode out passing the Arctic Circle outhouses and wondered why they were secured to the ground with heavy cables? (who would want to steal an outhouse?) 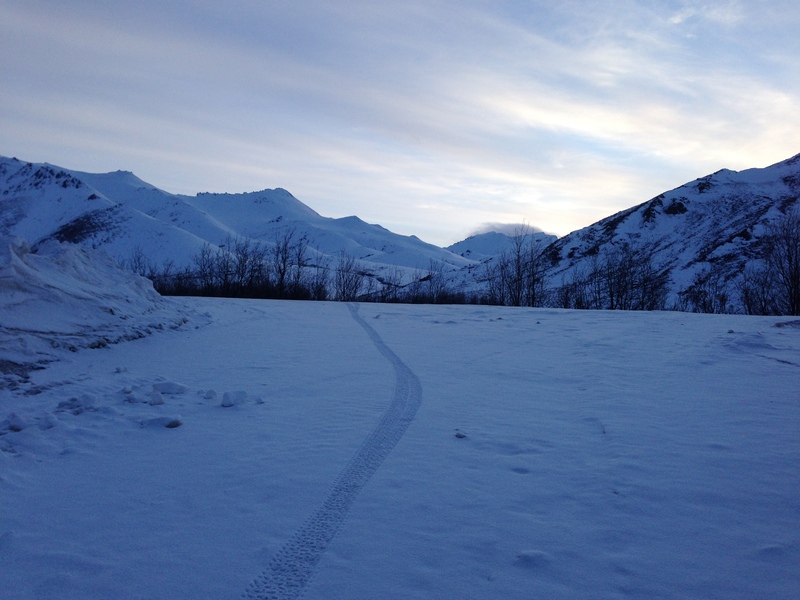 then out of the pull-off out onto the barely discernible Dempster highway. Outhouses secured from the wind with heavy cable. The first two drifts I encountered were firm enough and the fat bike glided over them, the third one let me get half way across then collapsed, and my front tire broke through sending me over the handle bars. The next few drifts were the same, the drifts got softer and deeper. Frustrated I turned around. I guess in hindsight I could have persevered and pushed my bike onwards hoping for better conditions; but I really wasn’t up for it, I was tired (it was darn cold). I figured the grader should be by soon and when the road was cleared I could follow the graded highway until dark and set up camp in hopefully more hospitable conditions. Back in the cab of the Truck I pulled out the ‘Great Escape’ book once again and read of the trials and challenges of the prisoners of Stalag Luft III prison camp (which made my present plight seem minor). Later that afternoon my book reading was interrupted by the sound of the road grader, looking out the window I saw the grader with a rotary plow attachment by-passing the pull off. I jumped out of the truck and attempted to stop the operator but he was a man on a mission and kept going, a very short while later as I was packing the bike in hopes to make a 3 hour dash before dark the grader returned and passed again, heading back to Eagle Plains, I knew then that he hadn’t cleared the pass. The wind was picking up and the temps dropping, I made the decision to spend another night in the Peterbuilt Hotel. I was in the bunk and sleeping bag early, bundled up in my warm clothes, toque and gloves, reading my book and thawing out a litre bottle of water I found in the truck. Eventually I did sleep. Then I awoke: at first I thought I was dreaming, there was a load noise, the truck was moving, rolling down the road, rocking back and forth. I sat up and tried to see out the front windshield it was dark and the window was frosted over, I crawled out of my sleeping bag and jumped behind the steering wheel ready to apply the brakes, I still couldn’t see out the windshield but I could see out the side and the truck wasnt rolling away, it was rocking back and forth, the wind was howling. The sign is still there; guess the trucks not rolling away! I came to my senses; that’s what it was; the Dempster wind, rocking the truck cab violently back and forth with every huge gust for what seemed like an eternity; it was relentless, I thought it might actually tip the truck over it was that intense, ‘scary’. Needless to say I did not sleep until the early hours when the sky started to lighten and the winds died down. Later I awoke to a loud noise; not the wind this time but the rotary plow grader and a snow plow chugging by outside the window. It was late, after 10 am, I guess I slept in. It was Easter Sunday; it was a beautiful blue sky day the sun was shining and I was anxious to make some miles.